Here are things you can contemplate on as well as see and do on on Waikiki vacations. Waikiki, named from the Hawaiian word for “spouting fresh water,” refers to the springs that once fed into swamp lands. The swamps separated Waikiki from the rest of Honolulu. Located on the south shore of Honolulu, Waikiki Beach is Oahu’s as well as Hawaii’s primary and most popular resort area. Today, Waikiki still holds true to its name, as it is a spring for fresh new expressions of island traditions. The two primary thoroughfares through Waikiki get their names from Hawaiian royalty. You can find the most luxurious set of high-end hotels and designer shops on Kalakaua Avenue. This avenue is named for King Kalakaua, the last reigning king of the Hawaiian Kingdom. He was a patron of music, the arts and Hawaiian tradition. As this is the endearing term that historians have bestowed upon him, the spring-time Merrie Monarch Festival hula festival is also named in his honor. The second major thoroughfare is Kuhio Avenue, named after Prince Kuhio. Prince Kuhio was a champion of Hawaii’s interests and was was even a delegate to Congress. Every year, the Hawaii honors him by commemorating his March 26 birthday as Kuhio Day, as well as by draping a lei on his statue at Kuhio Beach. The areas along this avenue are known for quaint cafes, sophisticated restaurants, clubs and vibrant nightlife. Waikiki Beach lays beneath iconic Le’ahi Crater or Diamond Head, arguably one of Hawaii’s most famous natural landmarks. Diamond Head is an extinct volcanic tuff cone. It offers an excellent venue for relatively short, but exhilarating, hikes to its summit. Once you reach the top, you will enjoy commanding views of the Waikiki area. During the 1800’s, Waikiki was a retreat for Hawaiian royalty. For them, the area offered rest and relaxation on it secluded white sand beaches. In 1901, a local businessman built the Moana Surfrider Hotel in Waikiki in anticipation of more visitors coming to the islands. During this time, worldwide awareness of Hawaii as tourist destination was increasing. Both the Moana Surfrider Hotel, known as the First Lady of Waikiki, and the The Royal Hawaiian Hotel, called the Pink Palace of the Pacific, were popular Waikiki recreational locations for soldiers and sailors during WWII. In 1942, the US Navy exclusively leased the Royal Hawaiian Hotel as a rest and recuperation center for servicemen. The Royal Hawaiian Hotel, a great place to stay on Waikiki vacations. The Waikiki Reclamation Commission in 1907 led efforts to drain the surrounding swamps, improved roads and built new bridges to Waikiki an effort to increase commercial growth, tourism and travel to Oahu. 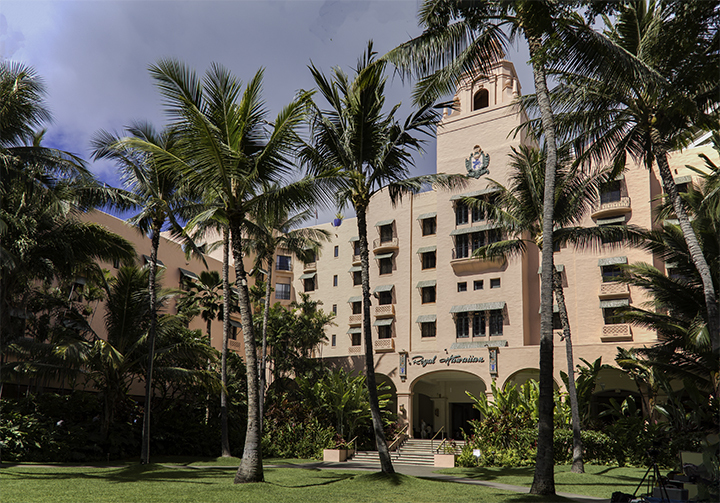 Such efforts were instrumental in enabling hotel and resort development throughout Waikiki. Waikiki is world famous for its beach which has served as an iconic symbol of Hawaii’s natural beauty. But because hotel owners built sea walls and groins, it altered natural wave action. This in turn, caused beach erosion. Waikiki has long contended with beach erosion since the 1800s. 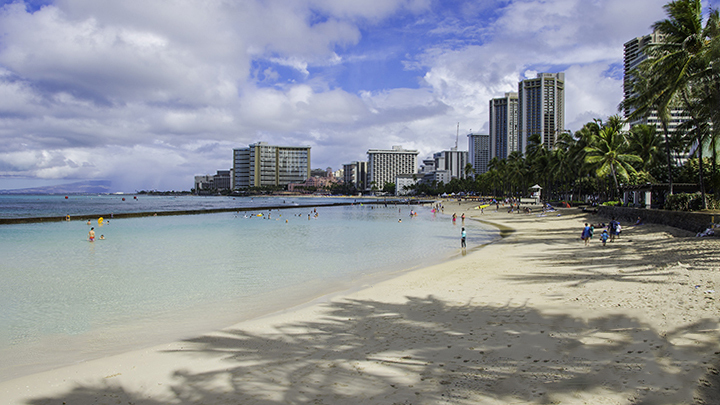 During the 1920s and 1930s, Hawaii shipped sand from California and deposited it onto Waikiki’s shoreline. This was an effort to restore as well as enlarge the beach area. Since 1939, the Army Corp of Engineers built additional seawalls and groins to counter erosion. Ever since then, it has been an ongoing battle with the forces of nature to maintain sand on Waikiki Beach. It’s ironic that most of Hawaii’s most famous beach, in a place most known for its natural beauty, is man-made. 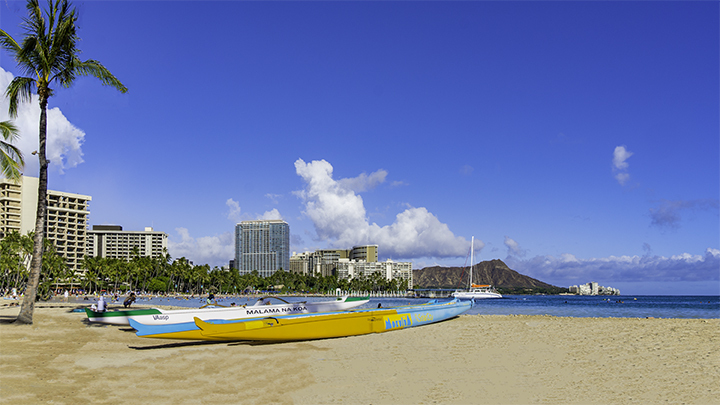 The areas along Waikiki beach where visitors can enjoying the ancient Hawaiian sport of surfing. Waikiki’s waves are known for their long rolling breaks. They provide the optimal long boarding experience for novice visitors and veterans of the sport alike. Here, Olympian and iconic Hawaiian waterman, Duke Kahanamoku, taught surfers and canoe paddling in the early 1900’s. 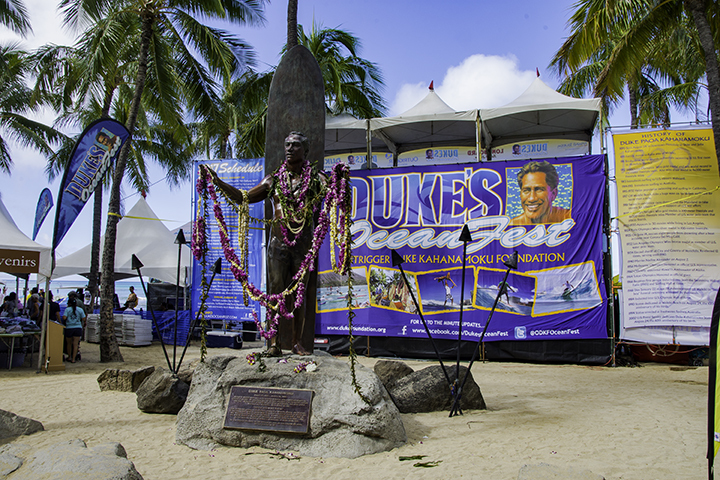 The Duke is famous for being the father of modern surfing. One can a statue of Hawaii’s Duke in Waikiki. Check out the Honolulu Zoo. Here, you can see a wide variety of animals as well as beautiful native Hawaiian flowers and vegetation. Visit the Waikiki Aquarium, where you can see a wide range of Hawaii’s reef fish and marine wildlife. When you get there, you can see Hawaii’s State fish, the humuhumunukunukuapua’a. Arrange to take lessons for the time-honored Hawaiian tradition of hula dancing. Places like the Royal Hawaiian Center can provide these at short notice. Waikiki also hosts numerous cultural events, outdoor performances, hula dancing and concerts at varying times throughout the year. You can find a number of these events at Kapiolani Park. King Kalakaua created this 500 acre park in the 1870’s and is the largest park in Honolulu. Within the park is the Waikiki Shell. Here, you can attend concerts by various musical groups as well as those performed by the Honolulu Symphony. From high-end restaurants to hole-in the-wall places, eating in Waikiki can be rich, varied and sometimes, even quite simple. For example, you can’t avoid the popular Spam musubi in Waikiki. A Spam musubi is rice with fried spam wrapped in nori or dried seaweed. The people of Hawaii love it so much, they host the Waikiki Spam Jam every year. A very popular and casual place for everyday Japanese food is Marukame Udon on Kuhio Avenue. Do your taste buds prefer something fancier? If so, you might want dine at the award-winning Orchids restaurant in the historic Halekulani Hotel. If you like to enjoy fine Chinese cuisine or traditional dim sum, we highly recommend Beijing Restaurant in the Royal Hawaiian Center. Enjoy hot malasadas (hole-less Portuguese-style donuts) at Leonard’s Bakery in nearby Kapahulu. You can find other famed local eateries in Kapahulu. There are places like Ono Hawaiian Food. Or you can try Rainbow Drive Inn where you can get one of Hawaii’s best plate lunches. If you run out of food options in Waikiki, food-lovers can opt for the eventful and award-winning Culinary Tours in Honolulu. So whether you surf, hike, canoe, swim, eat or relax in one of the luxurious resorts or restaurants, Waikiki is a guaranteed hit, full of activities and culture for everyone in the family to enjoy.